It was the RWE N Power Energy Challenge Regional Heats yesterday. 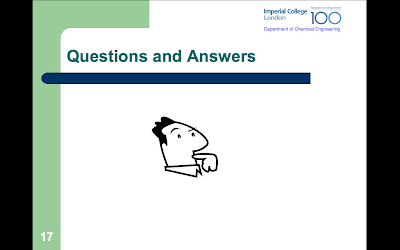 There were 8 teams in total, in which 3 came from Imperial College. 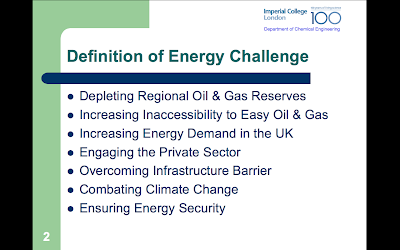 We all had very different ideas on how to tackle the UK Energy Challenge. 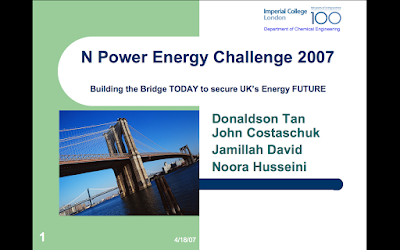 As chemical engineers, our perspective was on how to reduce the cost of Carbon Capture and Storage (CCS) because CCS is not only mandatory for new coal and gas power stations, but also it increases the cost of electricity production by a third. It is clear the UK will have to plug its impending energy gap with new coal and gas power stations but how would power stations pay for the increased cost of electricity production? It was the intention of my group to present a solution that can solve this dilemma. We first define the UK Energy Challenge according to the DTI Energy White Paper 2003 "Our Energy Future - Creating a Low Carbon Economy". 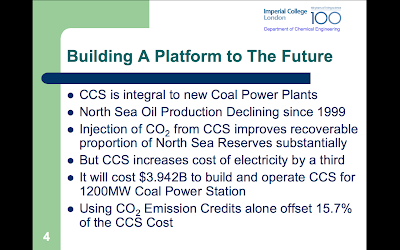 Next, we highlight that CCS is a mandatory component of all coal and gas power stations in the future. Using a 1200MW Coal Power Station as a basis, we estimated that the cost would be $3.9B using values from the IPCC Special Report on Carbon Capture and Storage 2005. 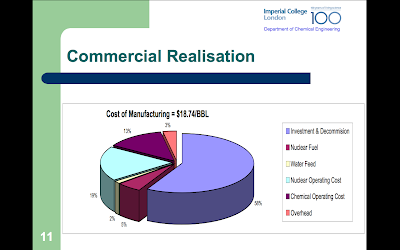 The rationale for including CCS is to extend the life of the oil fields on the UK Continental Shelf in the North Sea. Injecting Carbon Dioxide has been proven to increase the recoverable reserves from 40% to 45%, which is equivalent to $60B annually. This is known as Enhanced Oil Recovery (EOR). 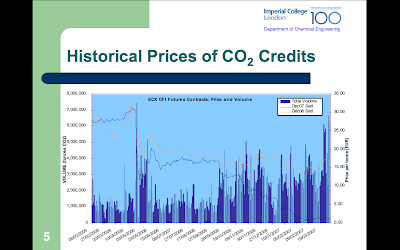 The aim of showing the historical prices of carbon dioxide emission credits is to emphasise that carbon trading alone is not sufficient to offset the cost associated with CCS. 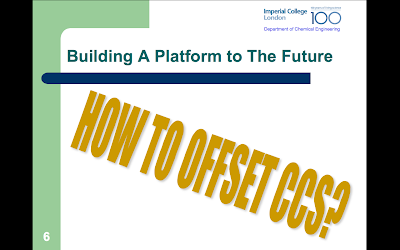 In fact, carbon trading is only sufficient to offset 15.7% of the total CCS cost. In fact, it is the perspective of my group that CCS itself is the barrier to plug the UK impending energy gap and we aim to overcome CCS. In this way, we not only can combat climate change, but also ensure the energy security of the UK. This is our simple solution. However, designing the plant is not a simple task. 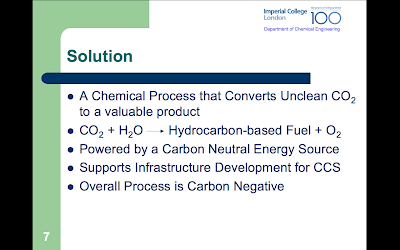 This is a pictorial representation of our solution to overcome the CCS barrier. We intend to offset the cost associated with CCS by 2 mechanisms - the sale of synthetic crude and savings generation due to the fact that less carbon dioxide is needed for cleaning before transporting it to the North Sea for EOR. A 1200MW Coal Power Station generates 4.9M ton of Carbon Dioxide annually. 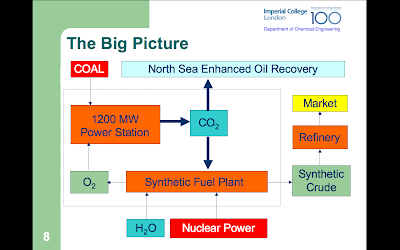 My proposed plant will consume 2.8M tons of carbon dioxide annually, so the coal power station only needs to rid sulphur and nitrogen in the remainder 2.1M ton of carbon dioxide before transporting it to the North Sea. 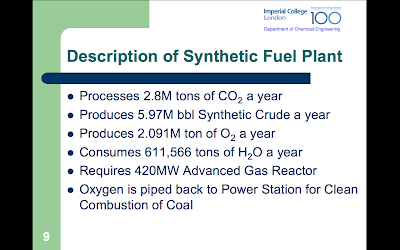 Here is a description of our Synthetic Fuel Plant. All heating power and electricity is derived from the 420MW (Nuclear) Advanced Gas Reactor. 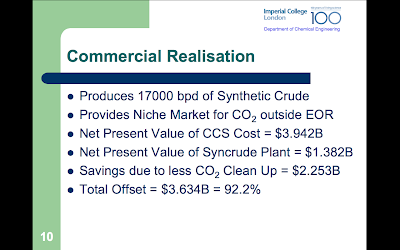 Although the production of synthetic crude is small, it is able to offset the CCS cost by 92.2%. I must emphasise that the strategic aim of manufacturing synthetic crude from carbon dioxide is to make CCS more affordable. Moreover, the fact that this plant processes 2.8M ton of carbon dioxide annually means it effectively reduces the carbon dioxide emission in the transport sector by 2.8M tons - 70% of the 2020 Reduction Target set for Transport by the UK Government. This is a substantial improvement from 15.7% Offset (using Carbon Dioxide Emission Credits Alone) to 92.2% (using our approach of combining carbon dioxide recycling with Emission Trading). I must admit the cost of synthetic crude production is high. It cost about $7-10/bbl for a rich oil field, and $12-16/bbl for a depleting oil field. 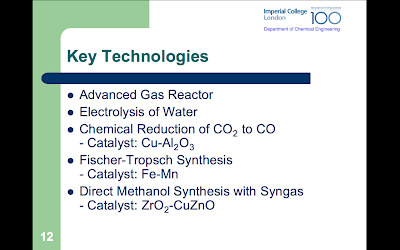 Our solution to overcoming the cost of CCS does have elements of technical innovation. AGR is 41% thermal efficient for electricity generation. The remainder energy is dissipated as waste heat. However, if we use the AGR as a source of heat to drive chemical reactions, then the thermal efficiency of the AGR would improve to 60-75% efficiency - typical efficiencies of an industrial heat exchanger. This is the key in increasing economic viability of nuclear technology today. If the UK public continue to persist in their anti-nuclear antics, the UK faces a potential strategic loss - the continued decommsion of nuclear power plants without construction of new nuclear power plants would mean the UK would loose an emminent skill base for nuclear technology in the future. The Chemical Reduction of Carbon Dioxide to Carbon Monoxide can be carried out with Cu catalyst supported by Alumium(III) Oxide. This reaction employs hydrogen as the reducing agent. It is carried out at 600 degree celcius, 50 bars. At this condition, an overall 70% conversion can be achieved with recycle. Without catalyst, this reaction can be carried out at temperature at 1000 degree celcius, 1.013 bar. However, the conversion would be very small. Both Fischer-Tropsch Synthesis and Direct Methanol Synthesis are well-established technologies today. 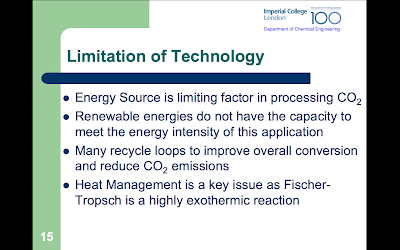 The Fischer-Tropsch Synthesis is the backbone of many Gas-To-Liquid (GTL) and Coal-To-Liquid (CTL) technologies today. GTL and CTL processes are employed by major oil companies such as Shell, BP, Conocophillips to convert Natural Gas and Coal into gasoline and diesel. 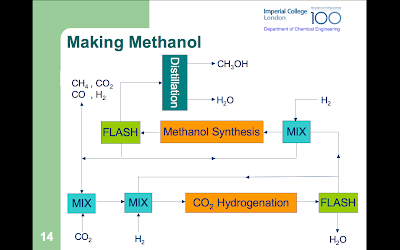 Direct Methanol Synthesis is the backbone of the Methanol Industry. The feedstock of Direct Methanol Synthesis is Syngas, which is principally manufactured through steam reforming of Natural Gas. 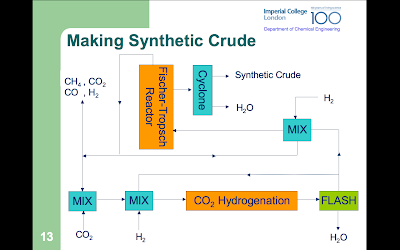 The flowsheet above demonstrates how synthetic crude is manufactured. Our plant is capable of producing methanol as well. This is to highlight the process flexibility of our plant, given that Syngas (a mixture of Carbon Monoxide and Hydrogen) can be manufactured into any hydrocarbons. In case that crude becomes obselette in the future, our process is capable of producing alternative valuable products which can aid in offsetting the cost of CCS. 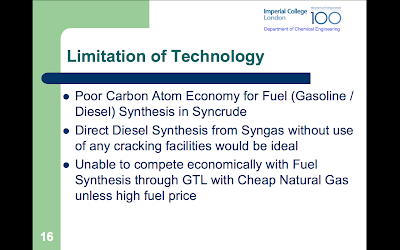 In fact, there is ongoing academic research for direct synthesis of gasoline from syngas. I must also stress that hydrogen is manufactured on-site from water. We believe methanol would be the transport fuel of the future. Why put our faith in methanol? We believe Methanol would be the liquid fuel of the future, replacing Gasoline in time to come. Methanol is a liquid fuel, unlike hydrogen, so there would be ease of transport and storage. In terms of energy density, methanol is 4.6kWh/L unlike hydrogen at 0.405kWh/L. Although the energy density of gasoline (9.7kWh/L) is twice of that of methanol. methanol can be manufactured from a variety of sources with relative ease, unlike gasoline. Moreover, methanol has a higher octane rating (105) than Gasoline. This means improved performance in a methanol-fueld Internal Combustion Engine. Moreover, methanol fuel cells in existence today are at least 60% efficient, running at near ambient temperature (60 degree celcius). Moreover, there is good carbon atom Economy for Methanol Synthesis and less energy intensive than the Direct Synthesis of Ethanol. Methanol can also be dehydrated to Dimethyl Ether which can run in Compression Ignition Engines. Of course, there would always be limitations with technology. I cannot deny that high crude prices make our process economically viable. As in any fuel manufacture process, it is always energy intensive. The amount of fuel produced is always limited by the capacity of the energy source available. What do you think of my presentation? Essentially, this is the long-term solution in making CCS a commercial reality without transferring the increment in cost of electricity production to the consumers.